Compatible with the optional Sonic Combat Module AND the X-Port Adapter (HBZ4020 & PKZ1055 - both required and sold separately). Compared to the Spartan look of most World War I airplanes, the smooth, rounded fuselage and flowing lines of the Albatros D.Va made it one of the more daring designs of its time. The ParkZone team has recreated this Western Front warrior with an impressive level of detail and equipped it with a potent 480-size brushless motor. 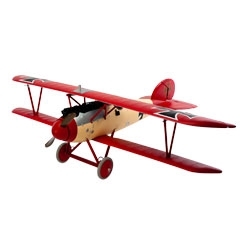 Some of the more notable scale details include a molded recreation of the 180hp Mercedes D.IIIau engine, accurately modeled wing struts and a pilot figure complete with flying scarf.